Temporary stumbles in promising growth stocks can make you massive returns. Since before 2008 and the last recession, Premium Brands Holdings (TSX:PBH) stock has delivered about 18% per year despite the recent 40% drawdown (I’ll explain why later). It’s a great time to accumulate Premium Brands shares, as they could be your golden ticket for tremendous price appreciation over the next 12 months. Premium Brands invests in food businesses, including manufacturers of specialty food products and food distribution businesses. It uses a decentralized management structure, which encourages an entrepreneurial culture. It aims to acquire brands that have leading positions in their markets and businesses that offer product differentiation. About 70% of its 2017 sales were in Canada and roughly 30% were in the United States. Its product offering is diversified across 15 categories, including sandwiches (23.4% of sales), premium processed meats (16.3%), beef (15.4%), seafood (9.7%), and burger patties (5.5%). In 2018, the company made three acquisitions to expand its meat offerings and support its solid seafood platform for future growth. 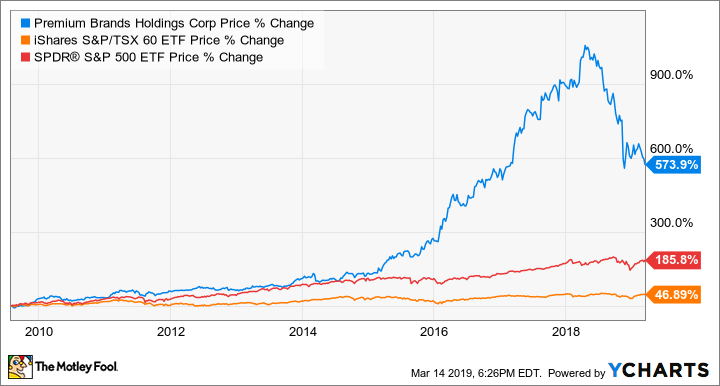 Premium Brands stock was way too expensive when it traded at about $120 per share at a price-to-earnings ratio (P/E) of roughly 40, as previous astronomical high growth rates weren’t sustainable for the long run. For example, the company nearly doubled its adjusted earnings per share in 2015, which is very difficult to replicate. As of writing, the stock has shaved off more than 40% and trades at a much more palatable P/E of about 20. Premium Brands just reported its full-year results for 2018 with sales up a massive 37.6% to more than $3 billion. This also triggered adjusted earnings before interest, taxes, depreciation, and amortization (EBITDA) to rise by 32.1% to $251.3 million. Adjusted earnings per share growth were 12.3% to $3.74, while free cash flow per share increased by 15.2% to $5.08 per share. Premium Brands topped it off with a dividend increase of 10.5% in early 2019. The company has been hiking its dividend every year since 2013 with a seven-year dividend growth rate of nearly 8.6%. The company paid out 51% of adjusted earnings and 38% of free cash flow as dividends in 2018, which support a safe dividend. For 2019, management projects sales growth of about 22% and EBITDA growth of 27-35%. Over the next five years, the company has a plan to increase sales to $6 billion and improve EBITDA margin to 10% (EBITDA margin was 8.3% in 2018). This implies estimated sales growth of more than 14% per year. With the company trading at a much more reasonable P/E, if it’s able to achieve its double-digit growth endeavor, it can very well trade much higher a year from now. Thomson Reuters currently has a mean 12-month target of $93.70 per share on the stock, which represents 32% upside potential. Meanwhile, the growth stock offers a yield of about 2.7%. PBH data by YCharts. The 10-year comparison of the price returns of the stock, the Canadian market, and the U.S. market. The Canadian and U.S. stock markets deliver long-term returns of about 7% and 10%, respectively. In comparison, Premium Brands’ total returns potential is massive.